WILMINGTON, N.C. – Bill Dooley, a three-time coach of the year in the Atlantic Coast Conference who piled up 162 wins at North Carolina, Virginia Tech and Wake Forest, died Tuesday. He was 82. His wife, Marie, said Dooley died of natural causes at their home in Wilmington. Dooley went a combined 162-125-5 in 26 seasons as a head coach with the Tar Heels, Hokies and Demon Deacons and took them to a combined 10 bowl games. He was the first North Carolina coach to win 11 games, leading the 1972 Tar Heels to an 11-1 finish. He is the only coach to lead the school to multiple ACC championships in football. “Coach Dooley helped change the course of college football,” said former North Carolina coach John Bunting, a captain on Dooley’s first ACC title team in 1971. 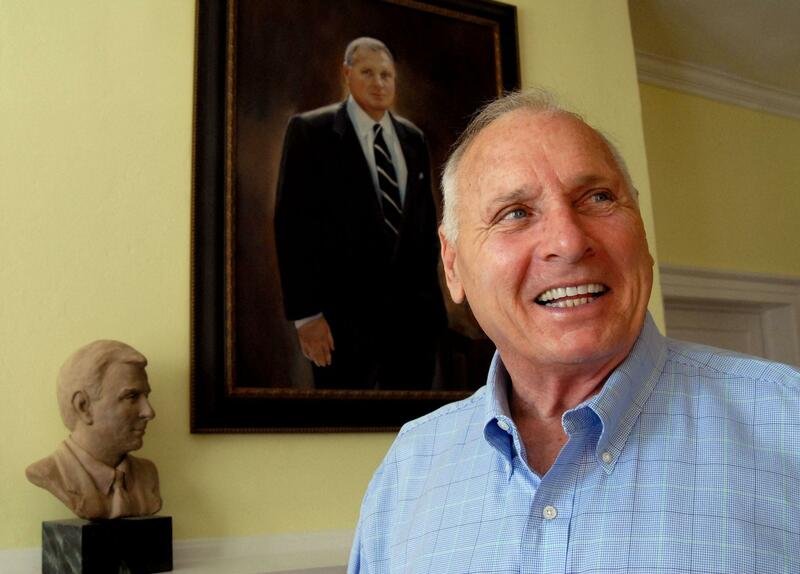 Dooley was the younger brother of former Georgia coach Vince Dooley, and the uncle of ex-Tennessee coach and current Dallas Cowboys assistant Derek Dooley. The Dooley brothers were going to be honorary captains for the season-opening Chick-fil-A Kickoff Game between North Carolina and Georgia on Sept. 3 in Atlanta, game spokesman Matt Garvey said. He said a moment of silence will be held in Bill Dooley’s honor. “Coach Dooley was a great coach and an even better man who made a lasting impact on this university and on college football as a whole,” North Carolina coach Larry Fedora said. He left in 1978 to become coach and athletic director at Virginia Tech and in nine seasons won 63 games – making him at the time the winningest coach in Hokies history until that mark was broken by Frank Beamer, who succeeded him in 1987. Dooley was hired at Wake Forest that year, and he led the Demon Deacons to three winning seasons in six years. He earned two ACC coach of the year awards at the school and capped his tenure in 1992 by taking the program to its first bowl game in 14 years, a victory over Oregon in the Independence Bowl. “He was, pure and simple, a football coach in the truest sense,” said ACC Commissioner John Swofford, a former athletic director at UNC. After he retired, he served as director of the North Carolina Sports Development Office and was the founder of the chapter of the National Football Foundation that covered eastern North Carolina and the Triangle area that includes Raleigh, Durham and Chapel Hill. Published: Aug. 9, 2016, 5:15 p.m.